From Fast Company's Blog "Co.EXIST"
Some schools are canceling recess. 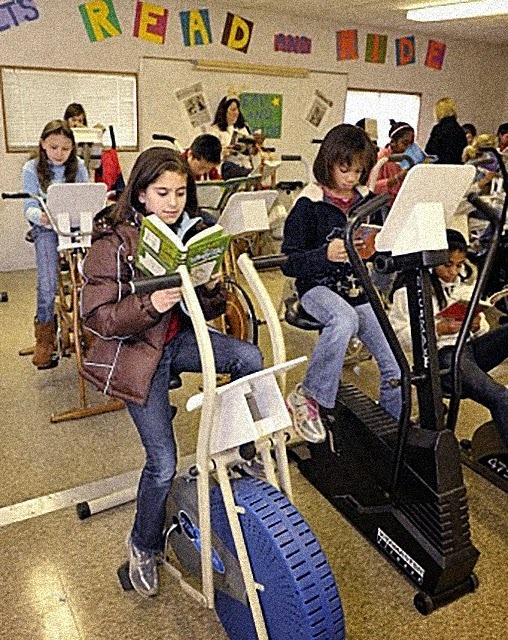 But this North Carolina grade school is going in the opposite direction: Kids ride bikes as they read. Elementary school has always looked a little bit like training for a traditional office job: You show up at 8 or 9, sit at your desk, and fill out paperwork for most of the day. An average third grader might spend as much as six hours sitting in the classroom--only a little less time than the average office worker spends sitting at work. But as more offices realize that sitting all day long is actually pretty terrible for health and productivity, how long will it take schools to catch up? While some elementary schools no longer have recess, and people like New Jersey Governor Chris Christie argue that school days should be even longer, a few schools are already moving in a different direction. Some are testing out standing desks, and realizing that a little bit of activity can actually improve attention spans. 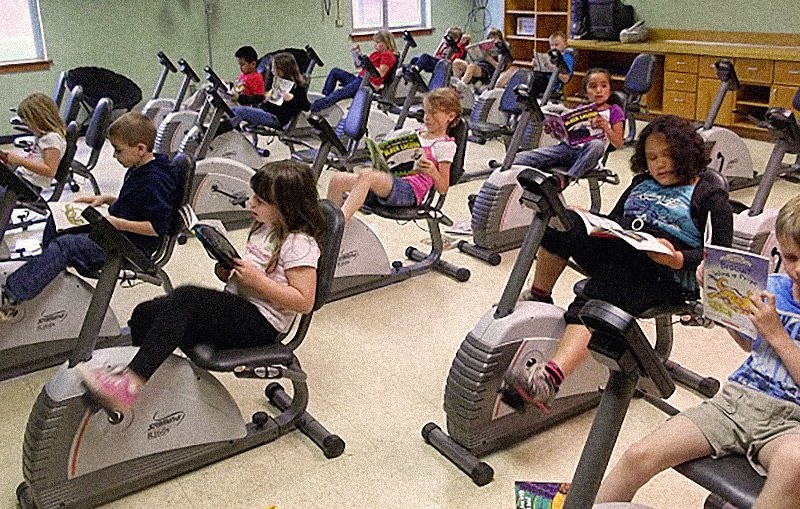 Others, like Ward Elementary in Winston-Salem, North Carolina, are starting to fill classrooms with exercise bikes, so students can work out while they learn. The Read and Ride program at Ward began five years ago. One classroom is equipped with enough exercise bikes for a full class of students, and teachers bring students throughout the day to use them. As they ride, they read. The combination burns calories, but it turns out that it also helps students learn better. As the elementary school analyzed testing data at the end of school year, they found that students who had spent the most time in the program achieved an 83% proficiency in reading, while those who spent the least time in the program had failing scores--only 41% proficiency. Some classrooms at the school also have an extra bike in the corner, so kids who can't sit still don't have to. Teachers also use time on the bike as a "reward" that happens to benefit the students. "Riding exercise bikes makes reading fun for many kids who get frustrated when they read," says Scott Ertl, who started the program. "They have a way to release that frustration they feel while they ride." Using the bikes also gets students to exercise when they might not otherwise want to in gym class. "Many students who are overweight struggle with sports and activities since they don't want to always be last or lose," Ertl explains. "On exercise bikes, students are able to pace themselves and exert themselves at their own level--without anyone noticing when they slow down or take a break." Over the last five years, the Read and Ride program has expanded to 30 other schools.